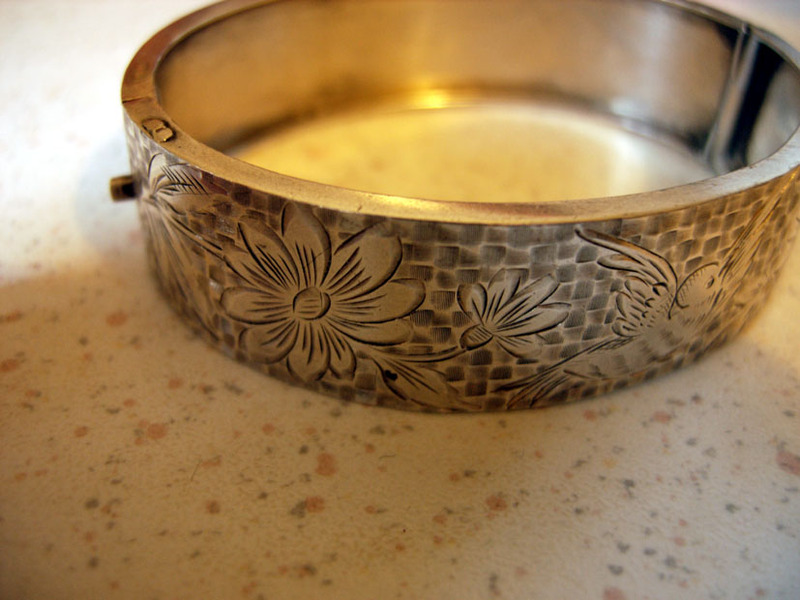 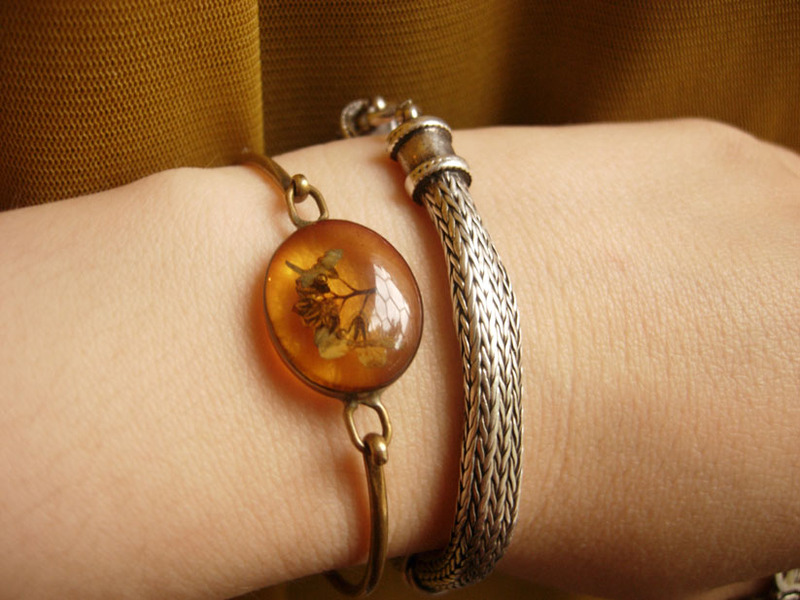 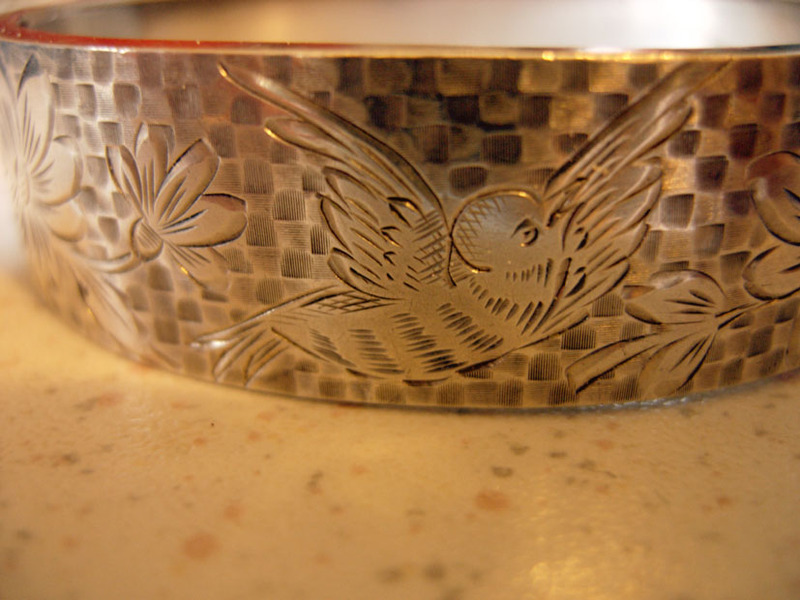 This metal bangle used to belong to my mother, in the late sixties. 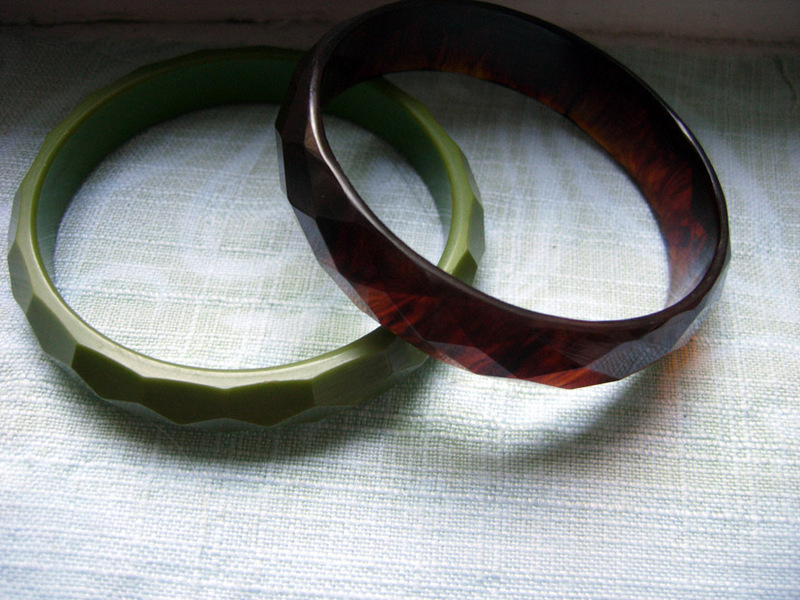 Bakelite and celluloid are some of my favorite things to find at the flea market. 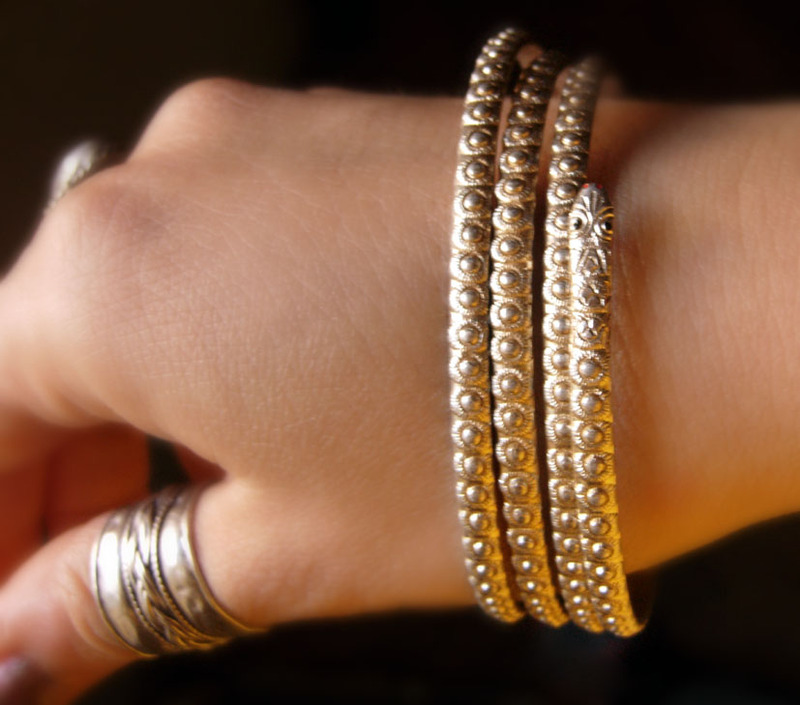 Also, I like the ritual of smelling them under hot water :), of never being completely sure. 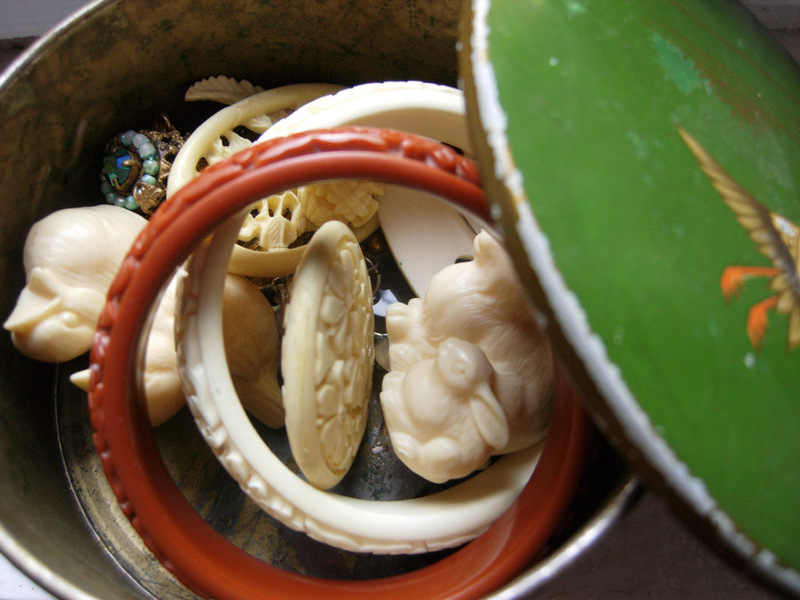 But as long as I don’t plan to sell them, I don’t care so much if all of these pieces are really bakelite (celluloid is much easier to recognize) or just some other type of early plastic. 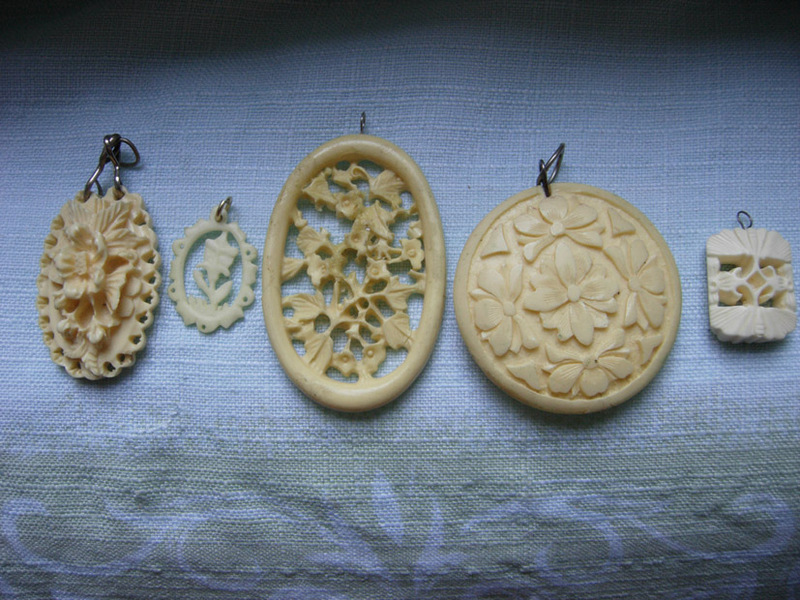 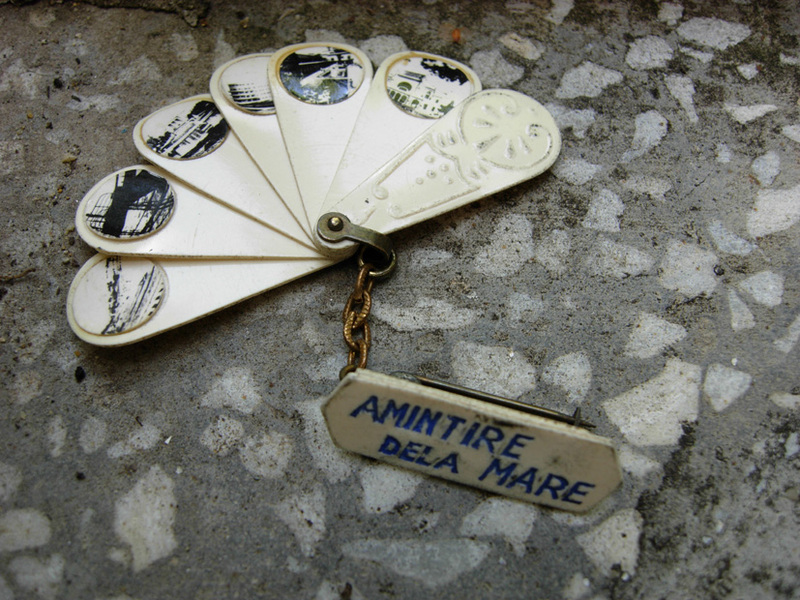 These pendants are all celluloid. 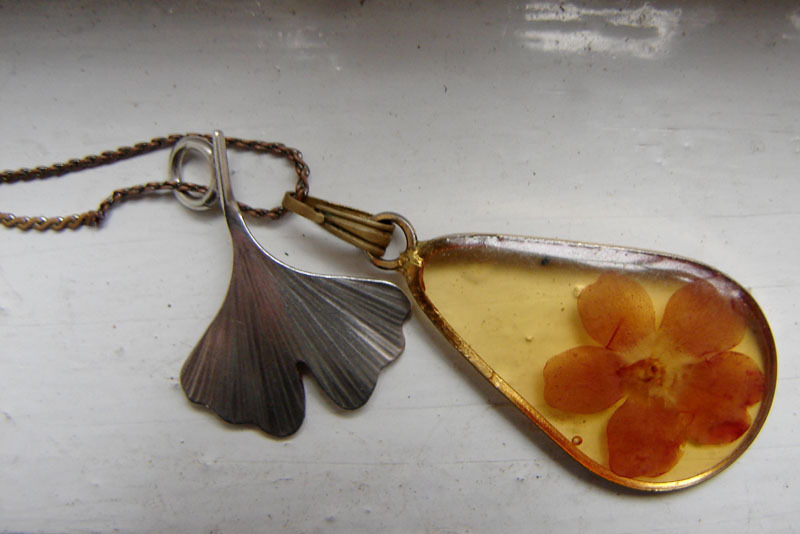 The smallest one with the flower and the oval one with lots of flowers belonged to my mother in the sixties. 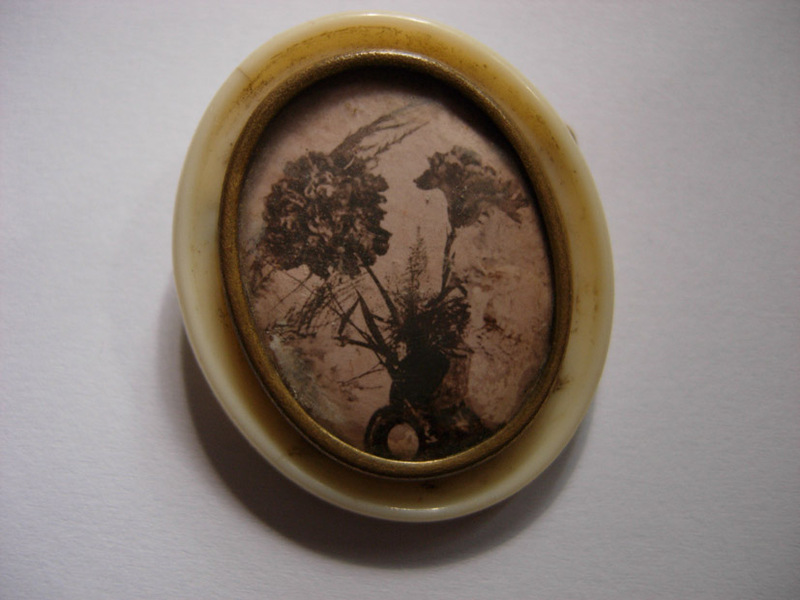 This pendant is reversed carved lucite mounted in silver. 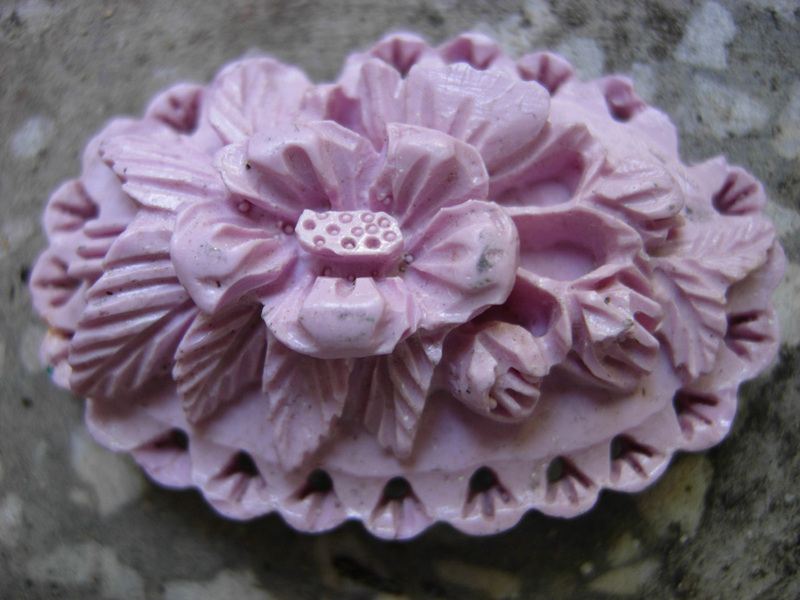 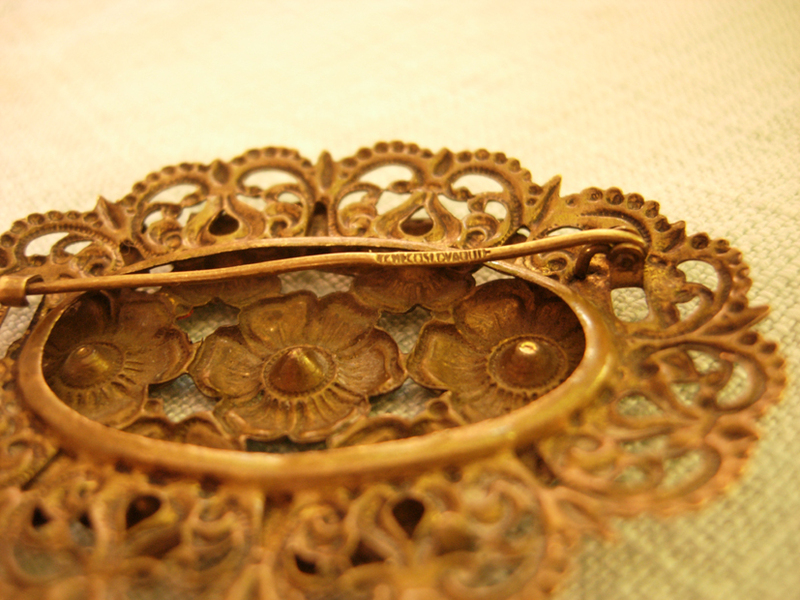 Also the brooch is from this material and technique, but I think the brooch is older. 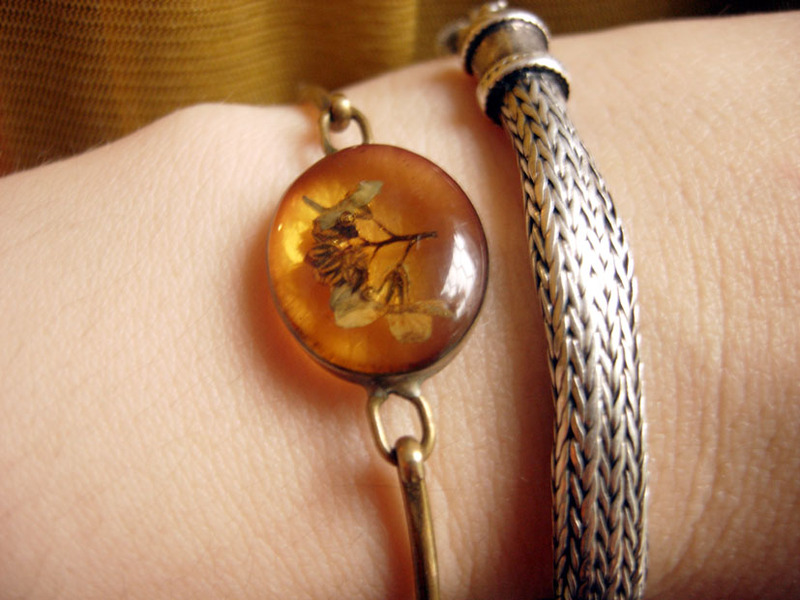 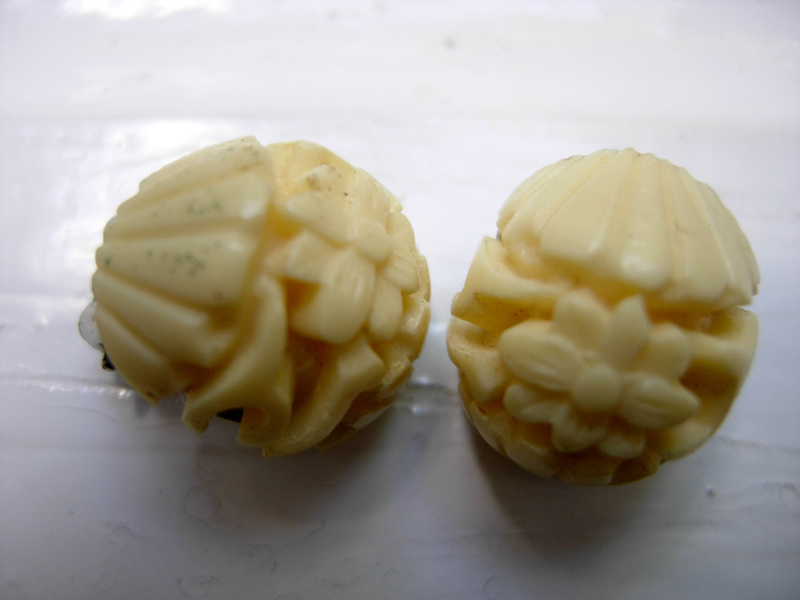 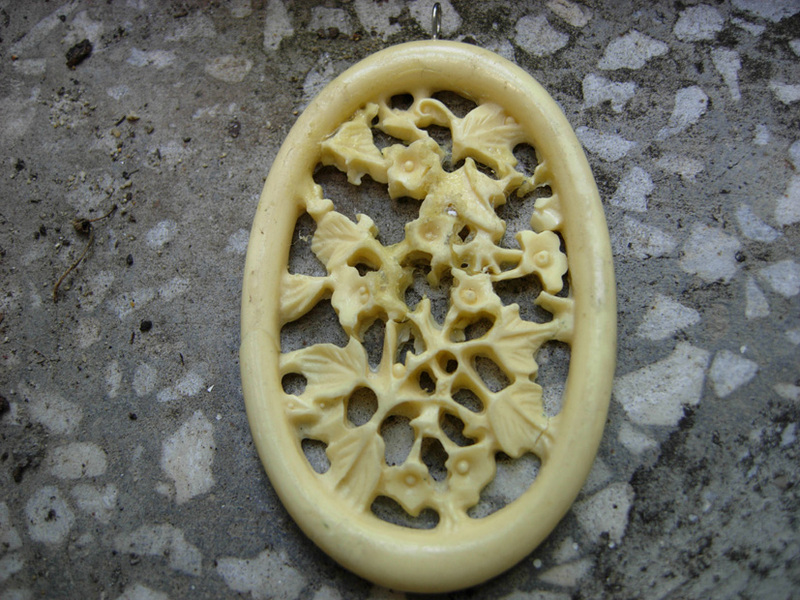 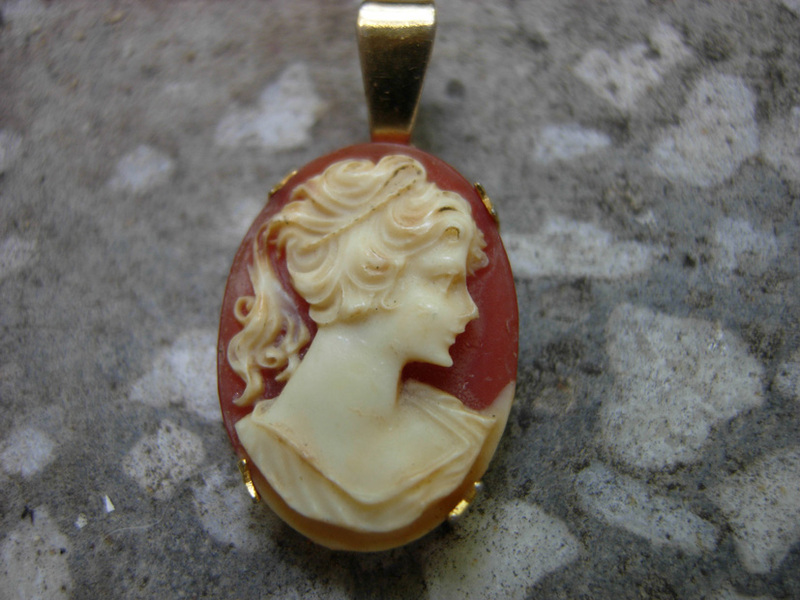 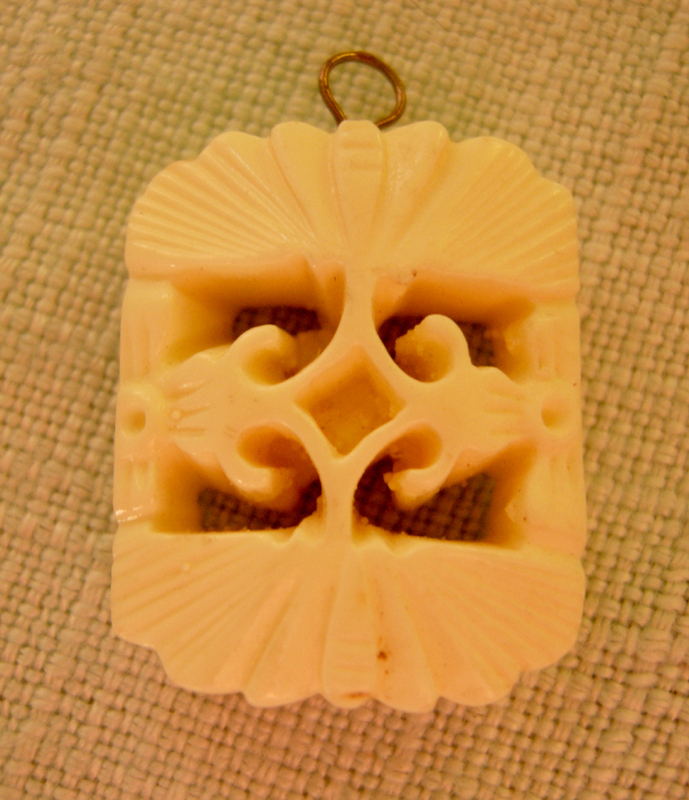 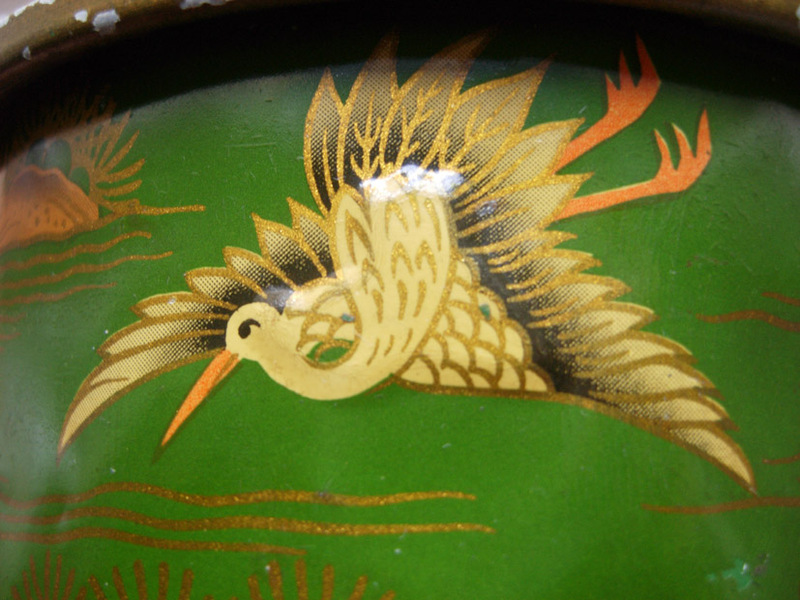 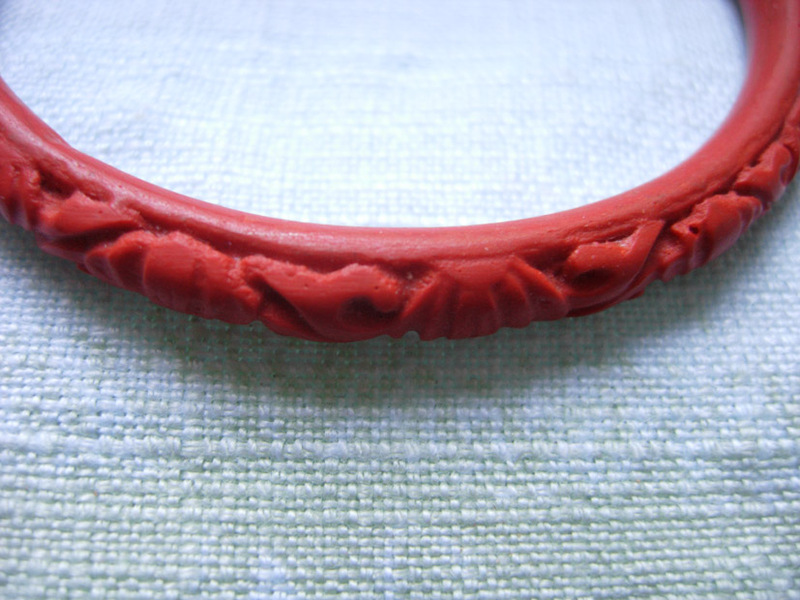 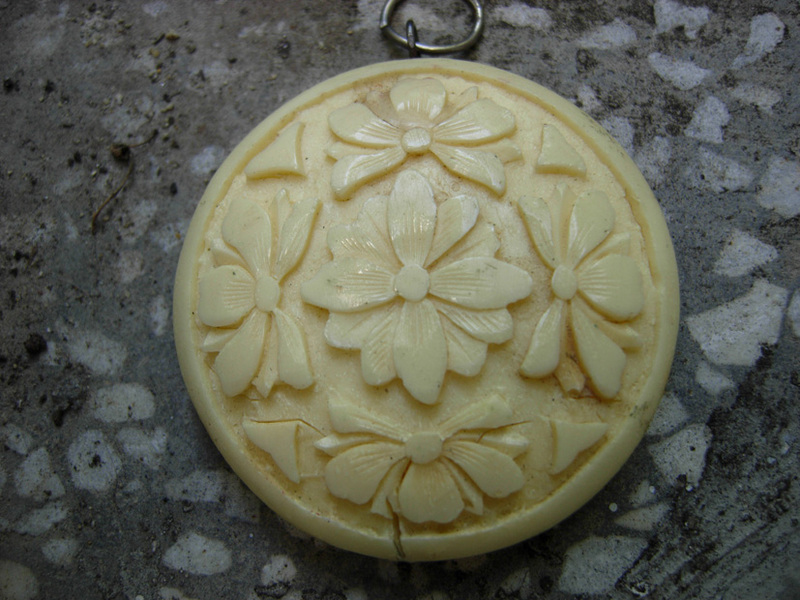 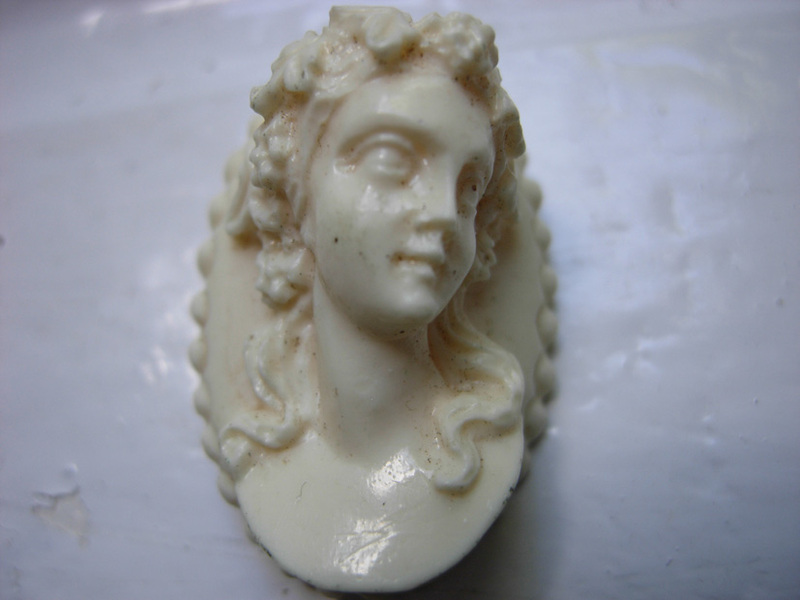 This small cameo is bakelite. 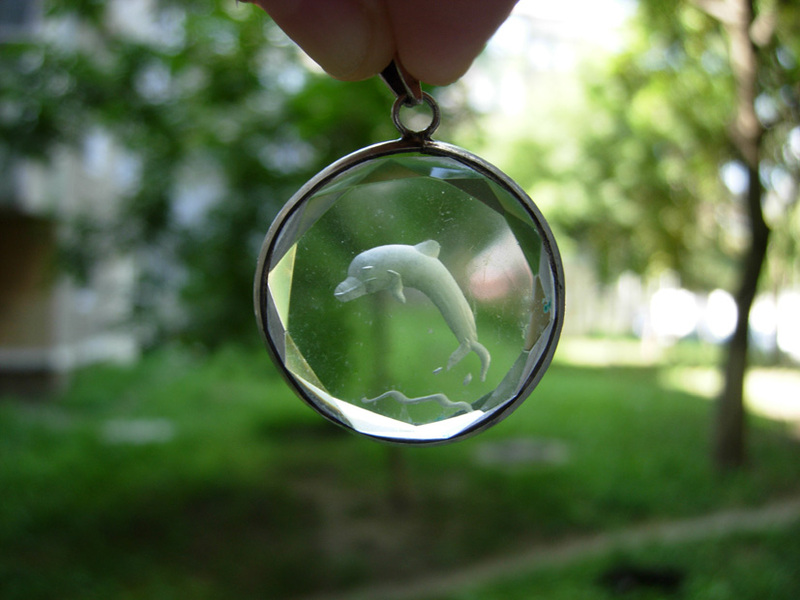 Not really my taste :), but still funny to have. 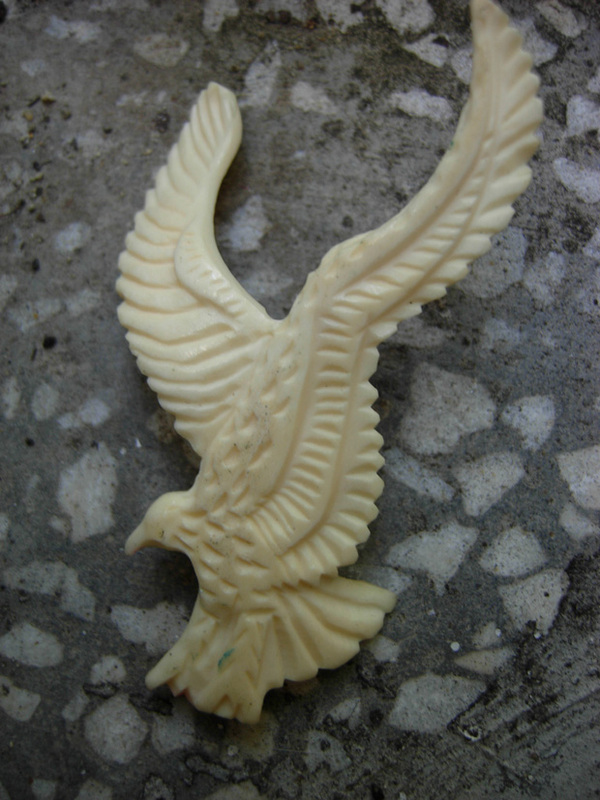 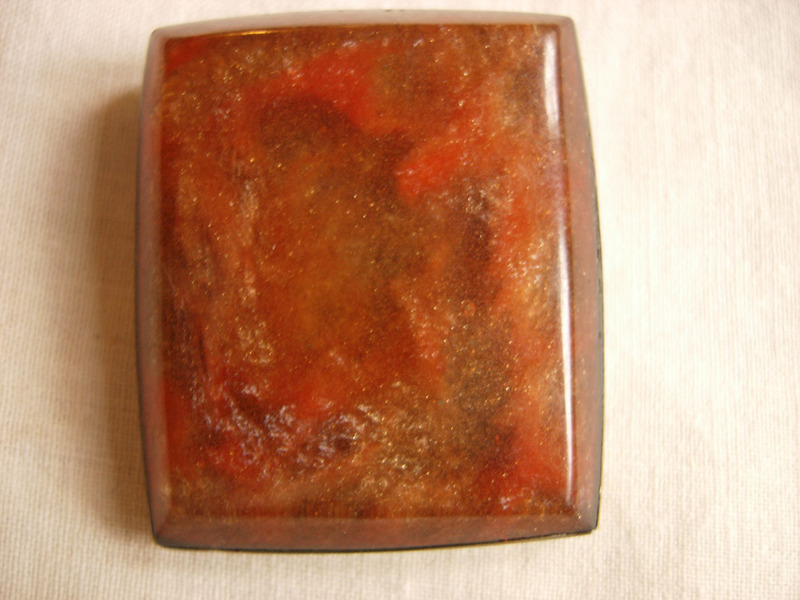 I’m not sure if I will wear this as a pendant, but it’s really nicely made with a soft texture. 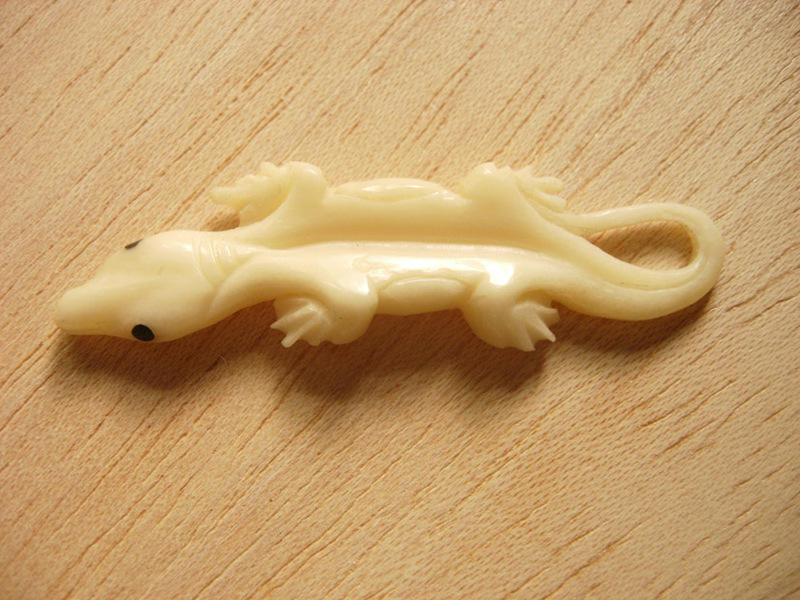 And it’s a lizard! 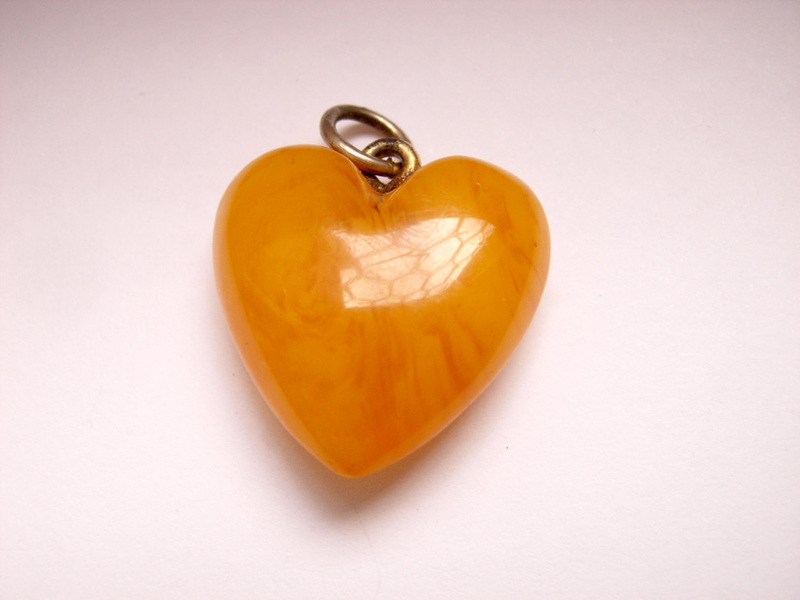 But this heart pendant goes really well with the rest of my jewelry, I’m actually wearing it while I type this. 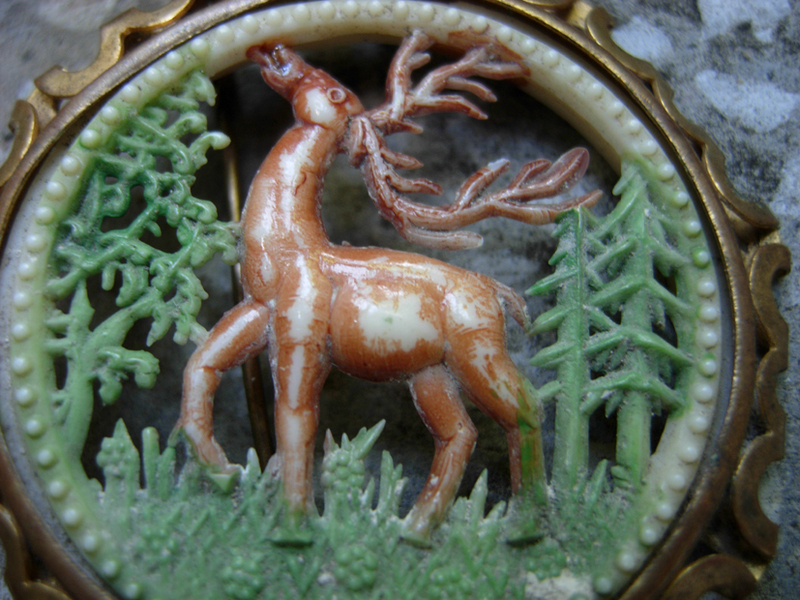 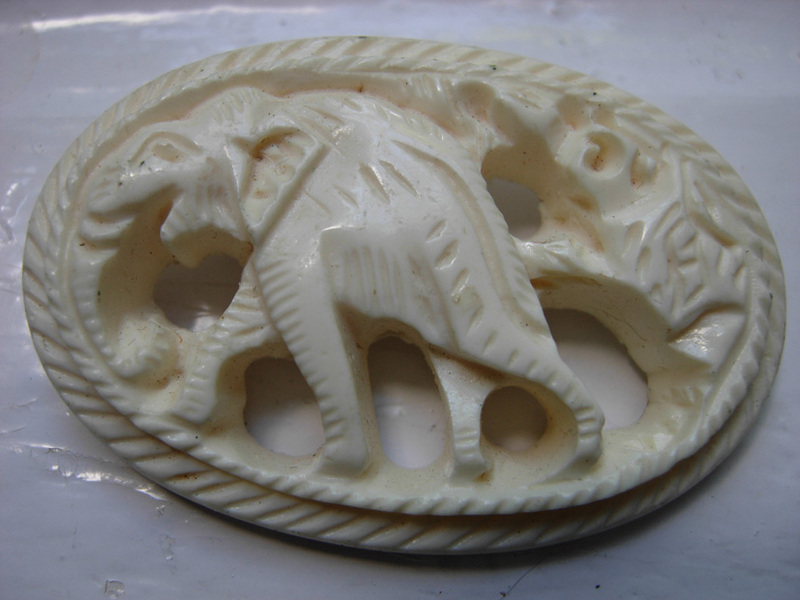 I have lots of brooches that are early plastic.The French celluloid one with the deer is really old, I have seen online similar ones dated as early 1900. 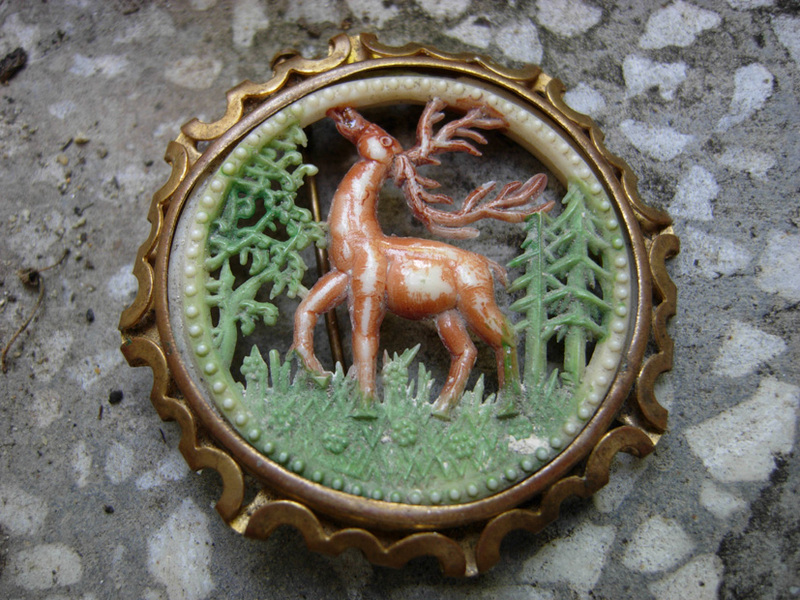 I have found this one in an old button tin. 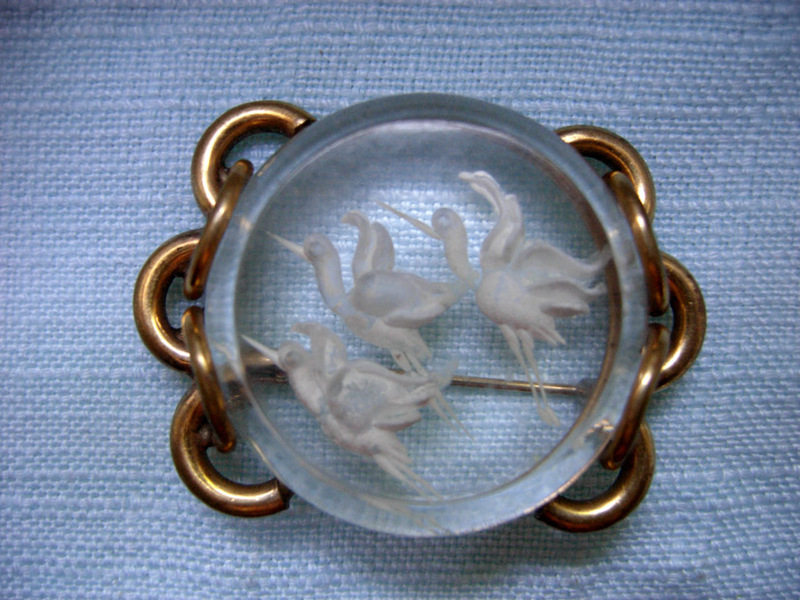 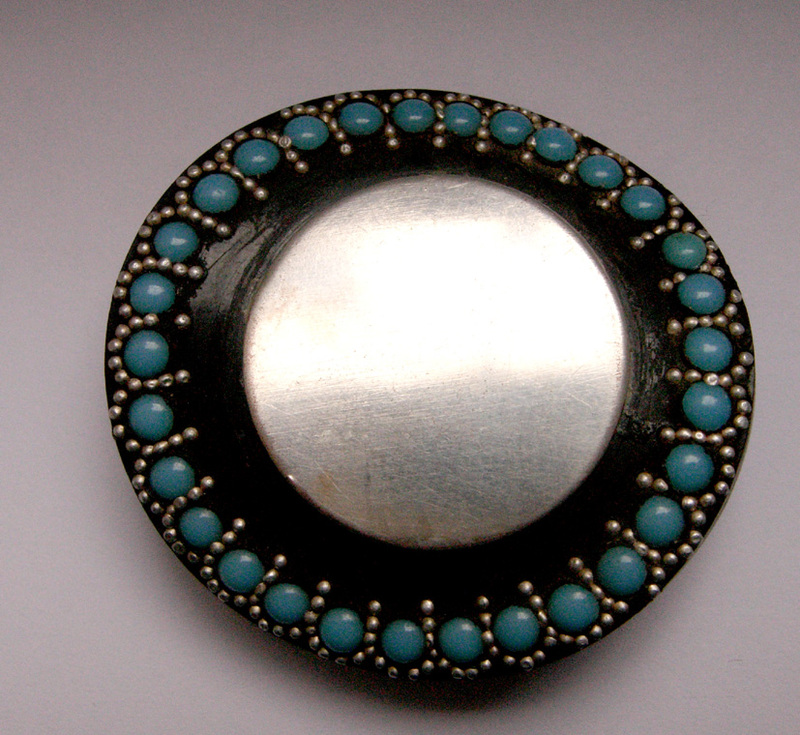 This really strange bakelite and silver Art deco brooch is one of my favorites. 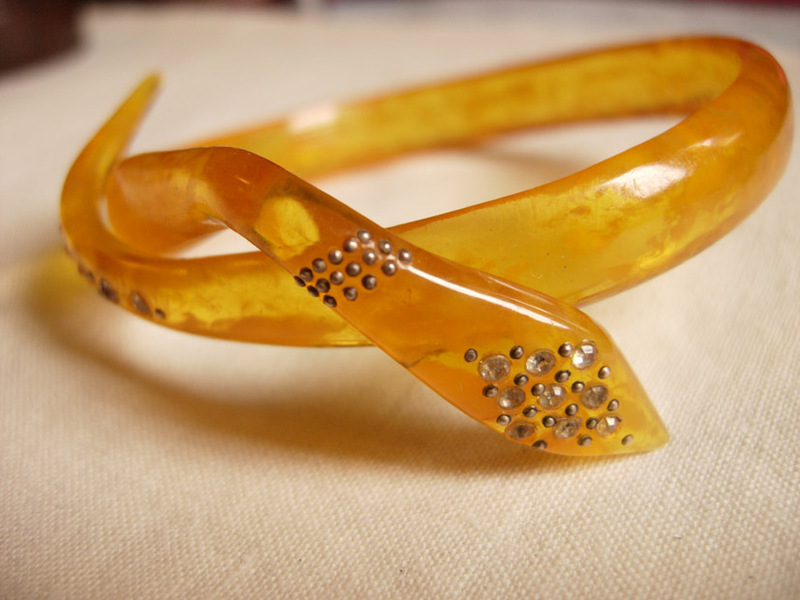 This huge brooch that is copying amber is lucite, with a very pretty depth to it. 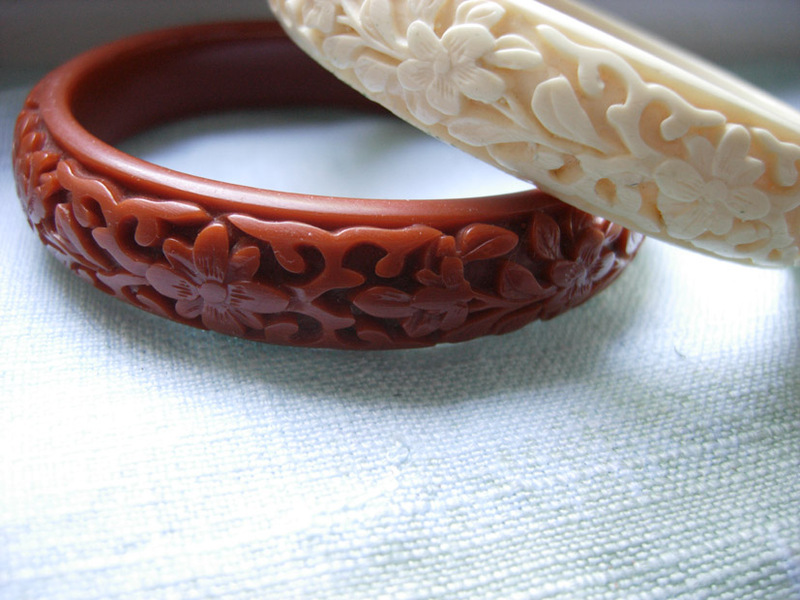 I’m always looking at plastic bangles at the flea market. 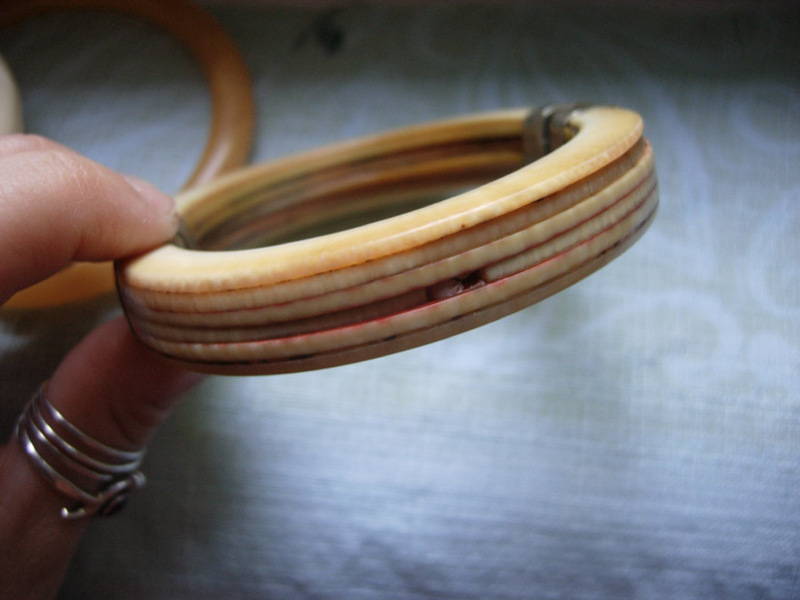 My favorite find is this celluloid snake from the 1920s. 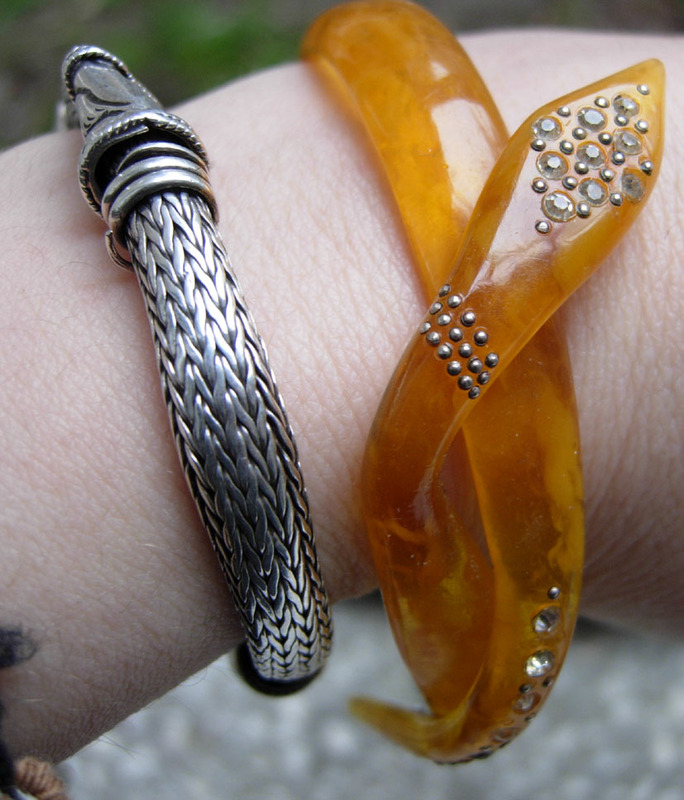 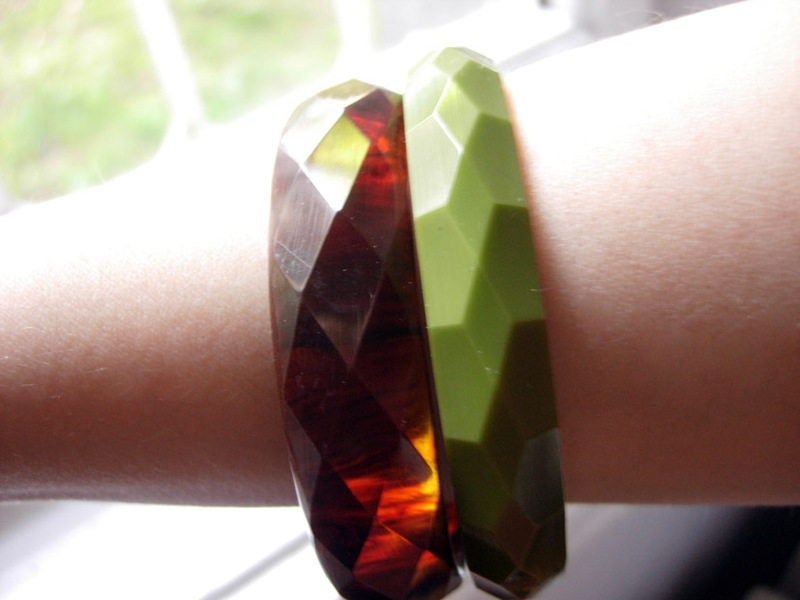 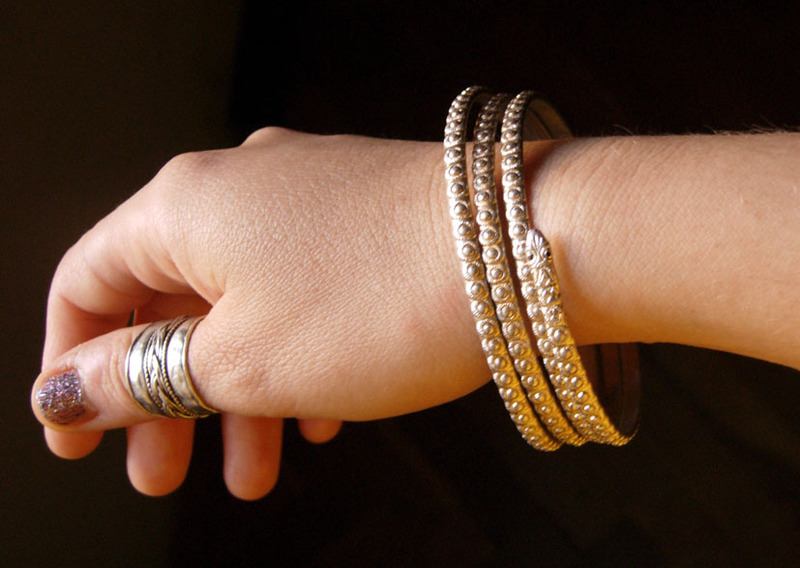 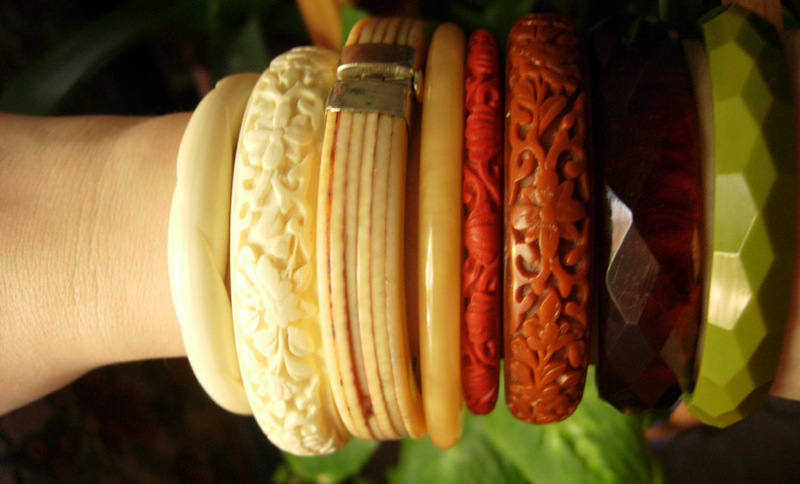 These bangles are Chinese, copying cinnabar. 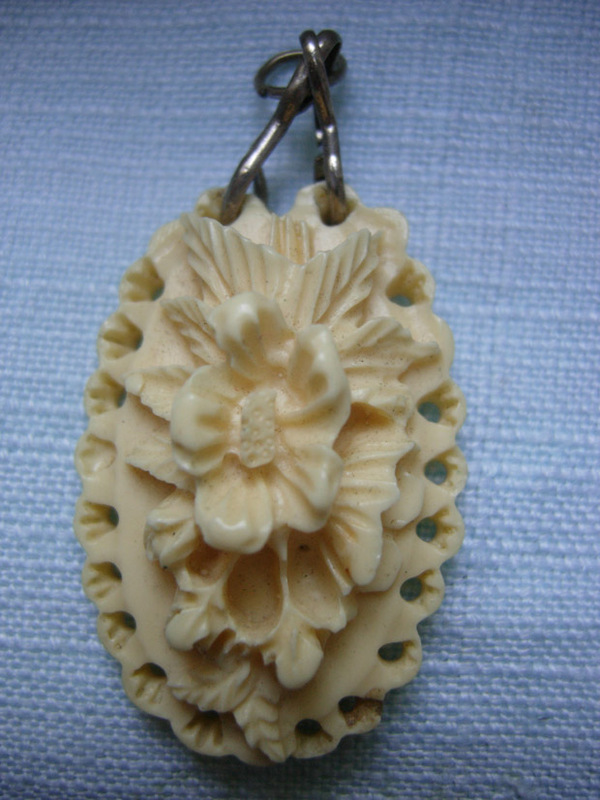 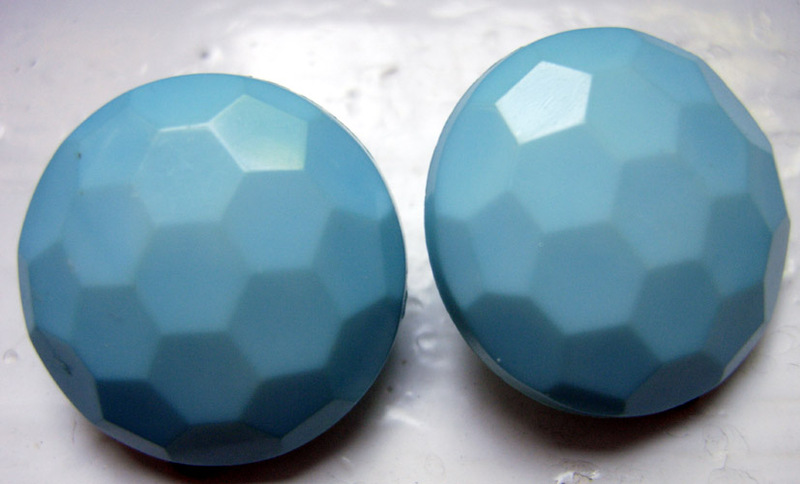 I have different things with this pattern (a pendant, beads, clip on earrings). 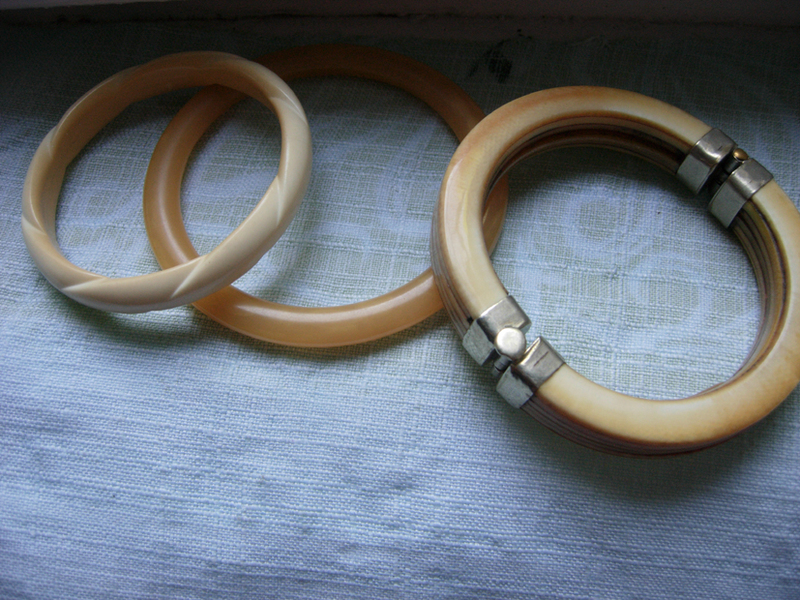 Although these are still produced in China, mine are older and they definitely smell like bakelite. 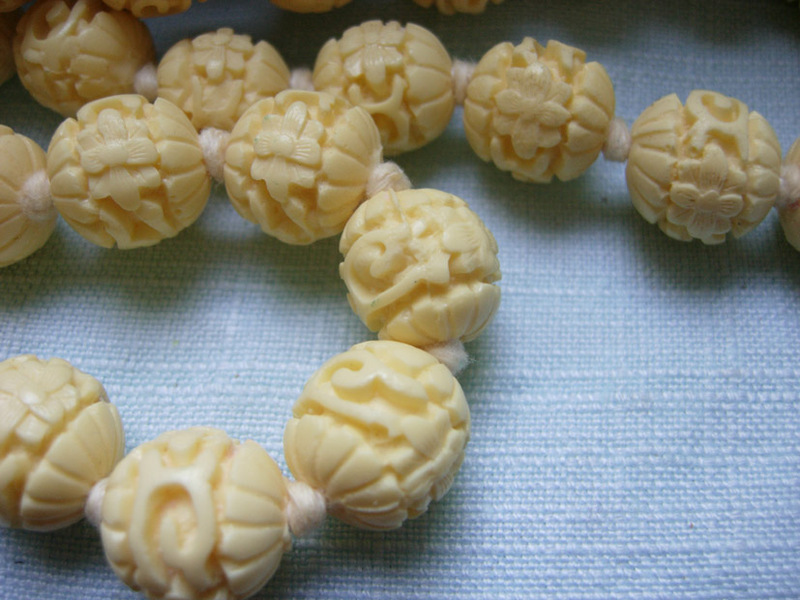 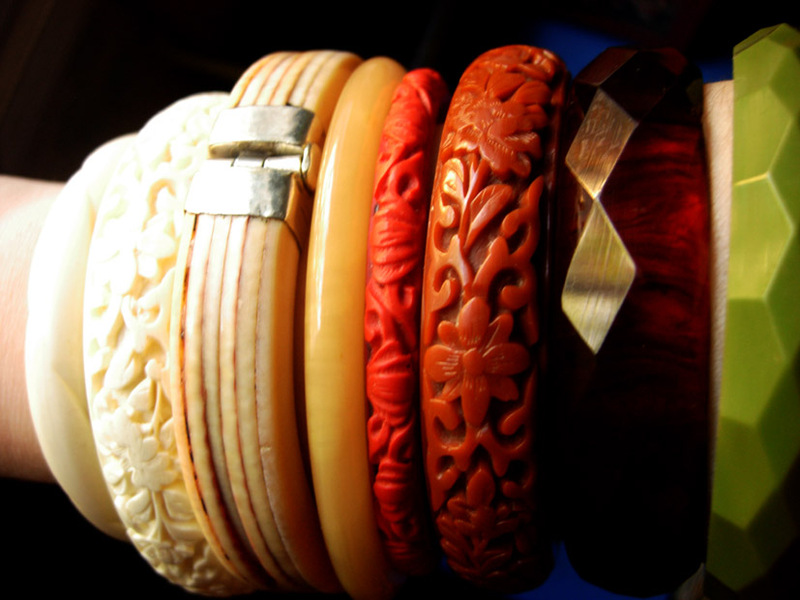 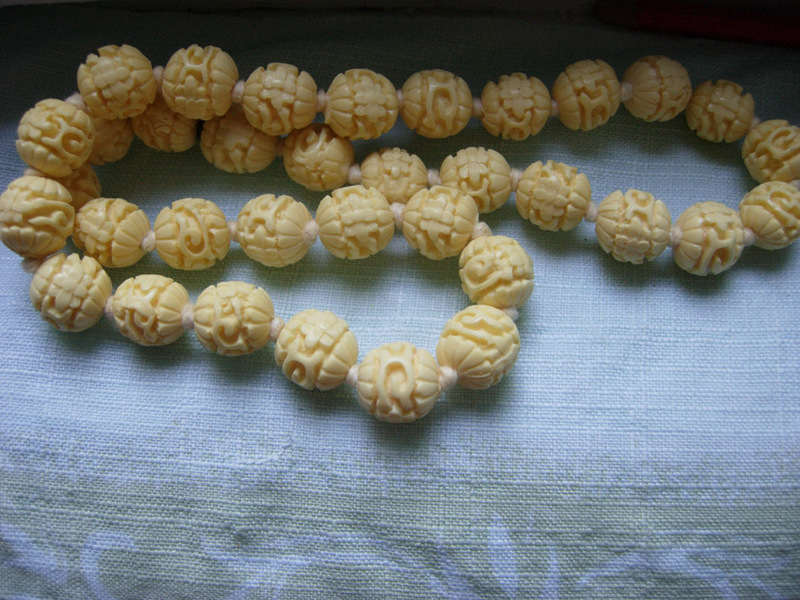 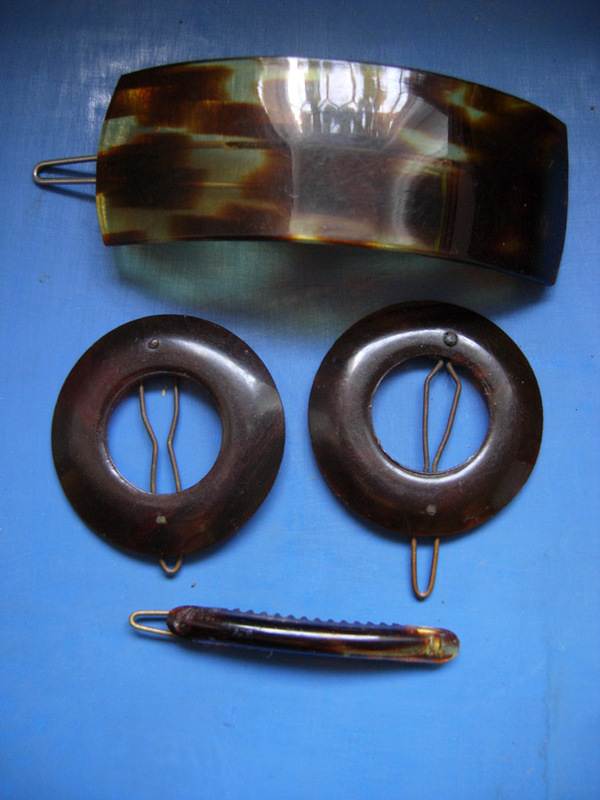 These are bakelite and celluloid. 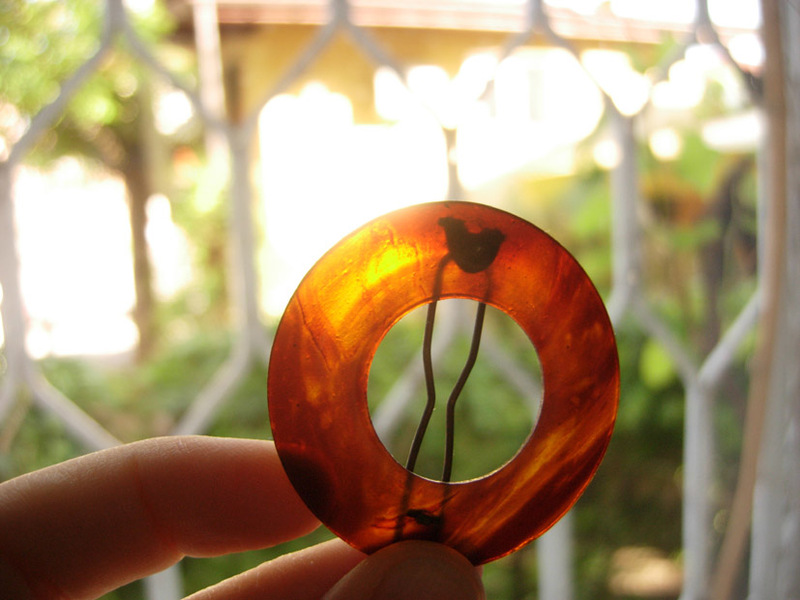 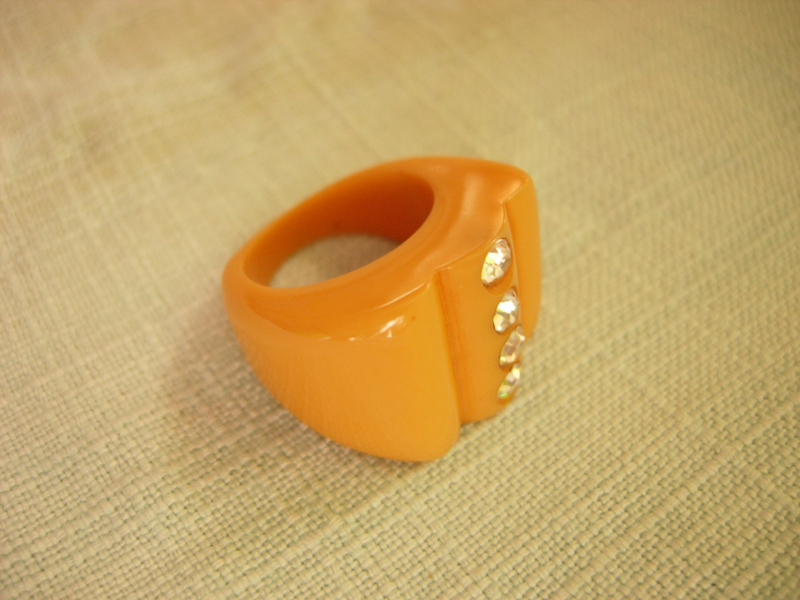 I only have one bakelite ring, although I’m always looking for them. 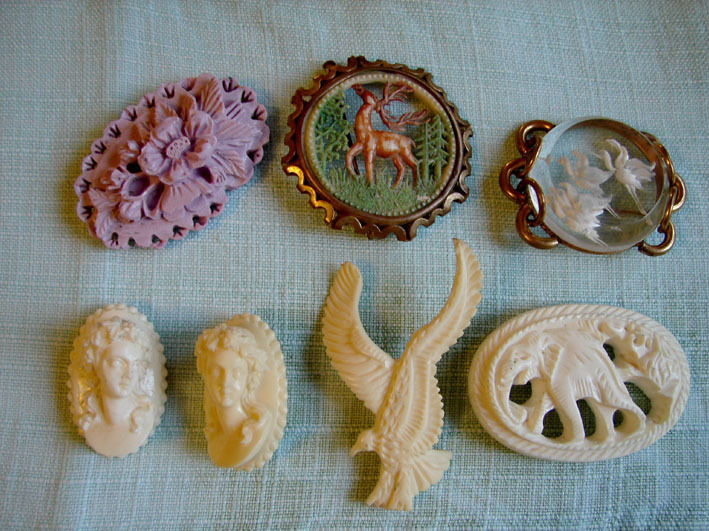 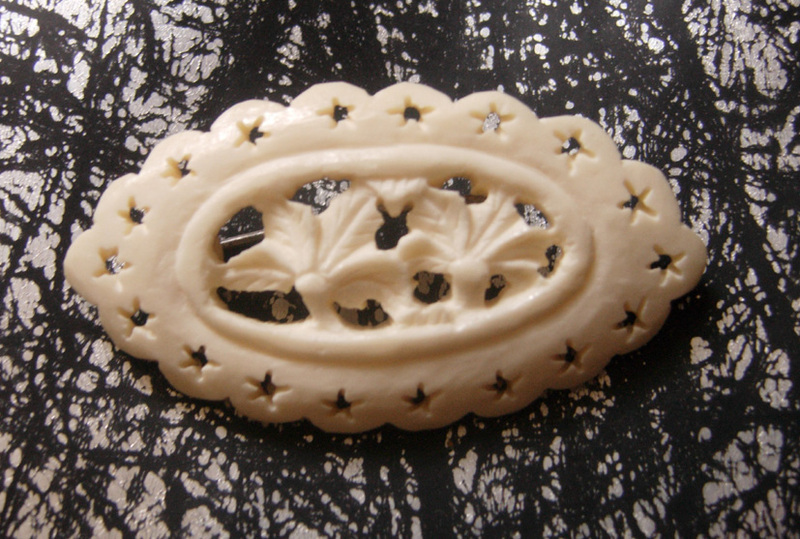 I have a few celluloid hair barrettes, but I don’t really dare to wear them, they could easily slide away from my hair. 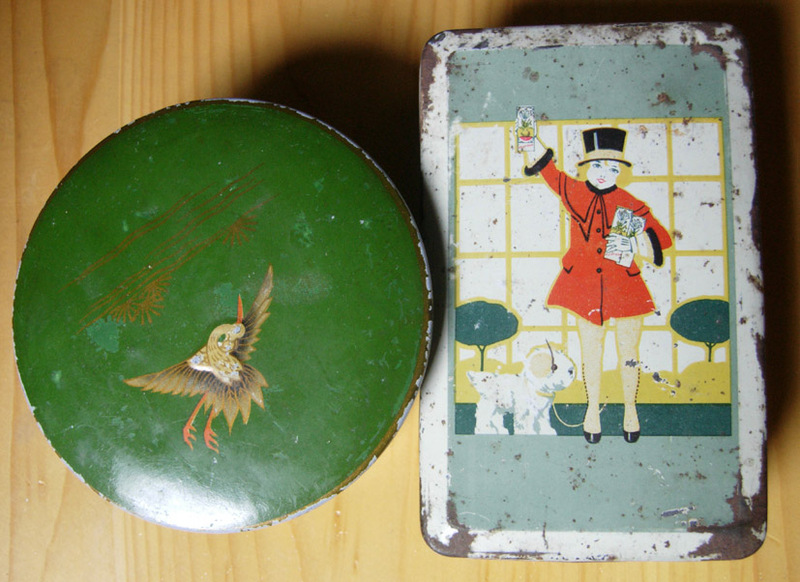 I keep all of these in pretty tins from the twenties. 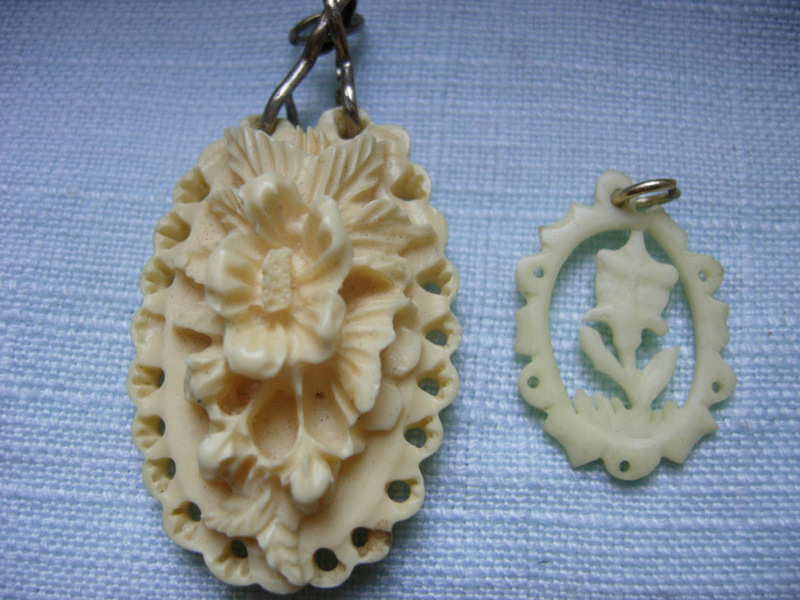 These are just part of the things I have found yesterday at the flea market. 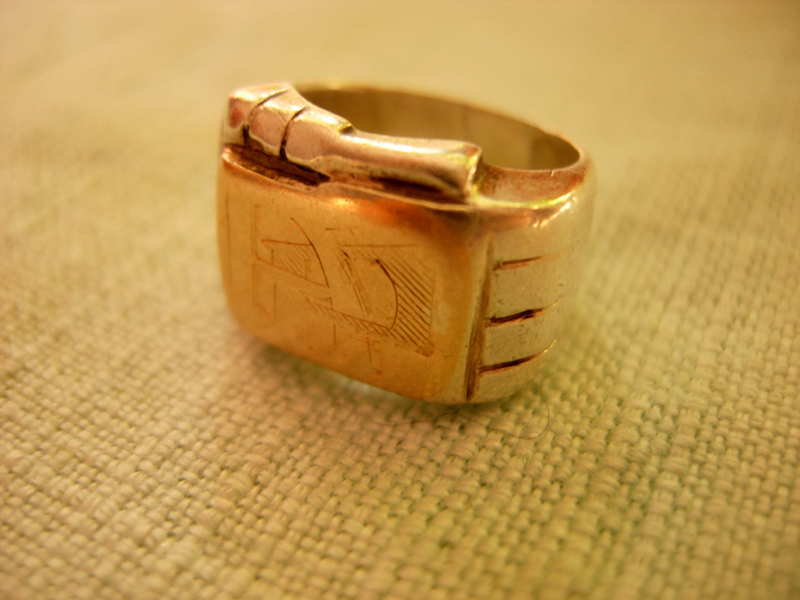 My favorite find is this really small size signet ring, that probably was made for a child. 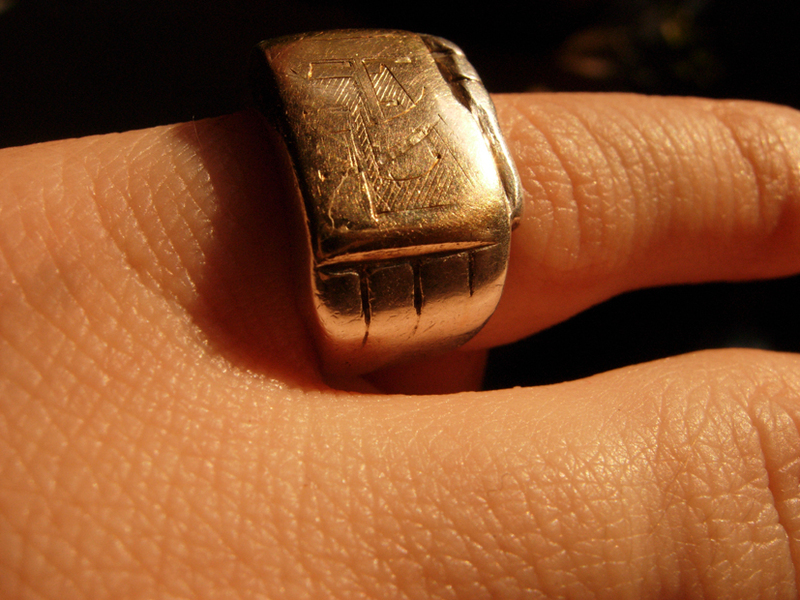 It only fits my pinky from my left hand. 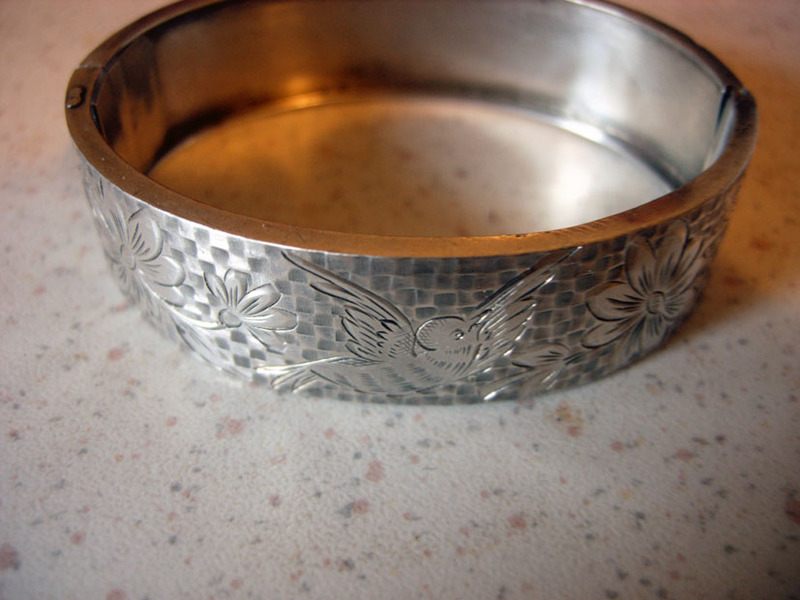 It’s silver with a gold plated part, and it is kind of roughly made. 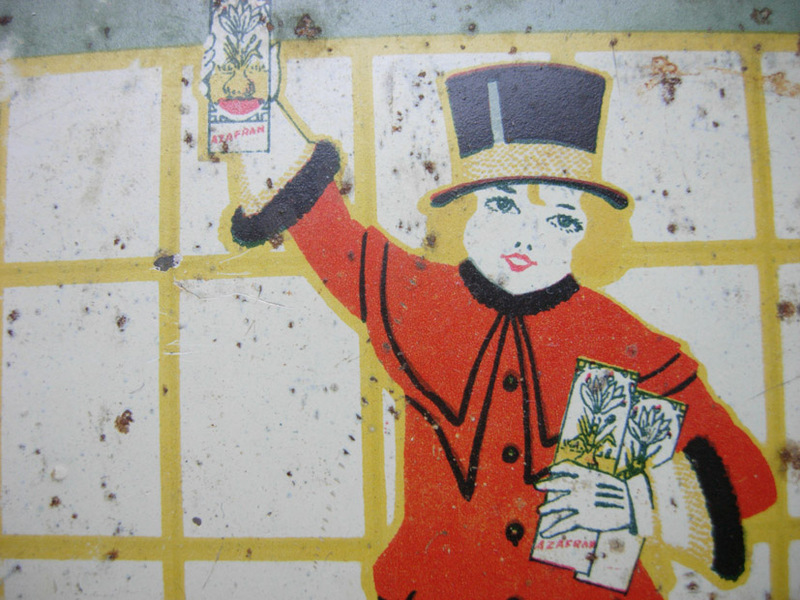 I have not idea about the period, but it’s definitely vintage. 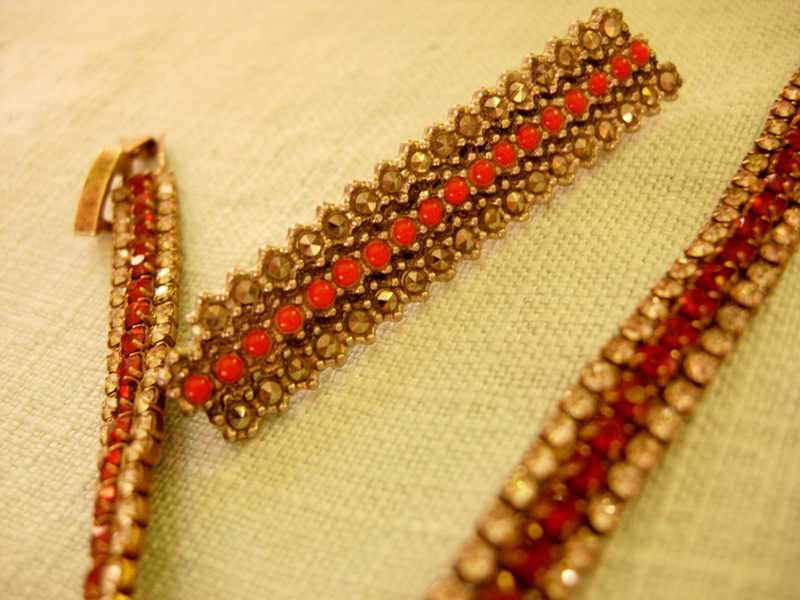 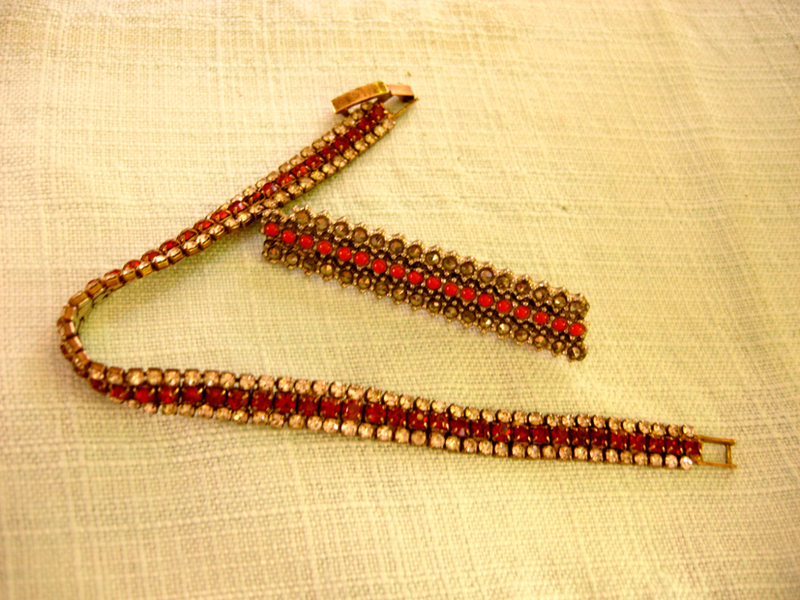 This rhinestone bracelet is from the fifties and it’s really well preserved, without missing stones. 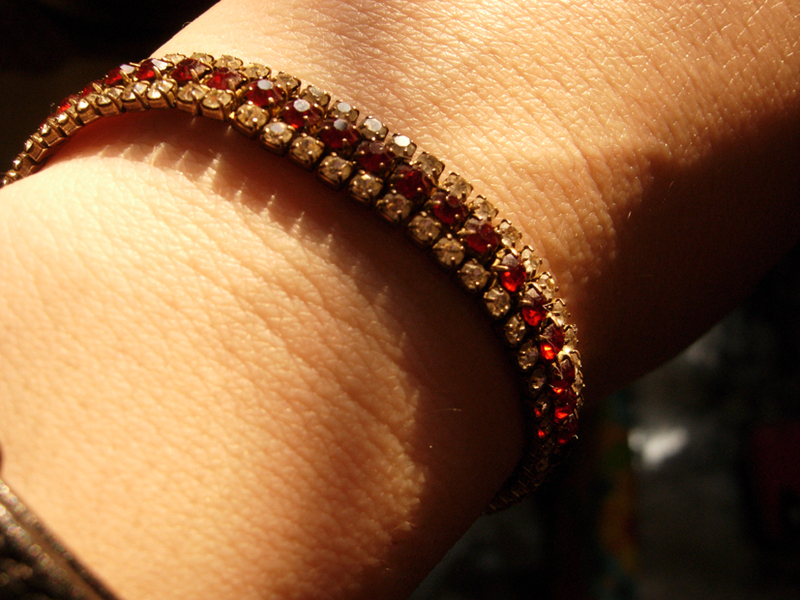 I really like that the stones are not that sparkly anymore. 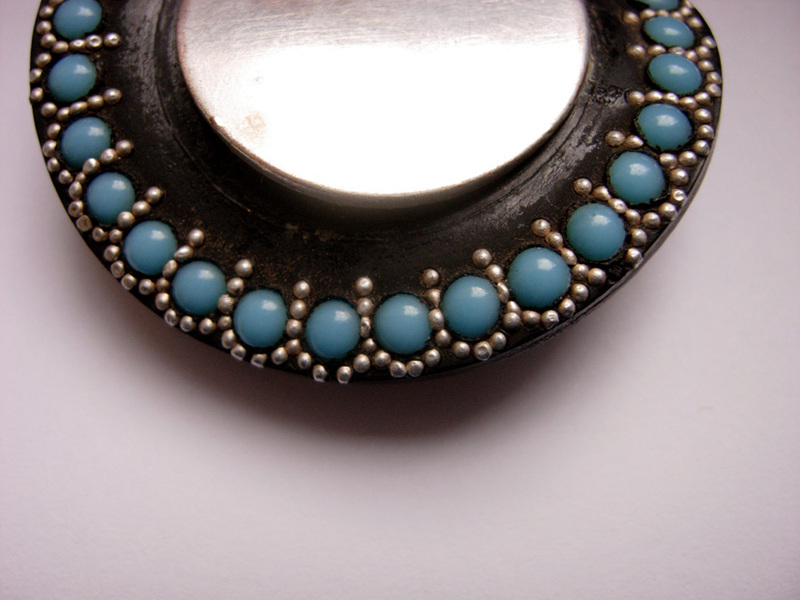 The marcasite brooch is not a perfect match but they look really nice together. 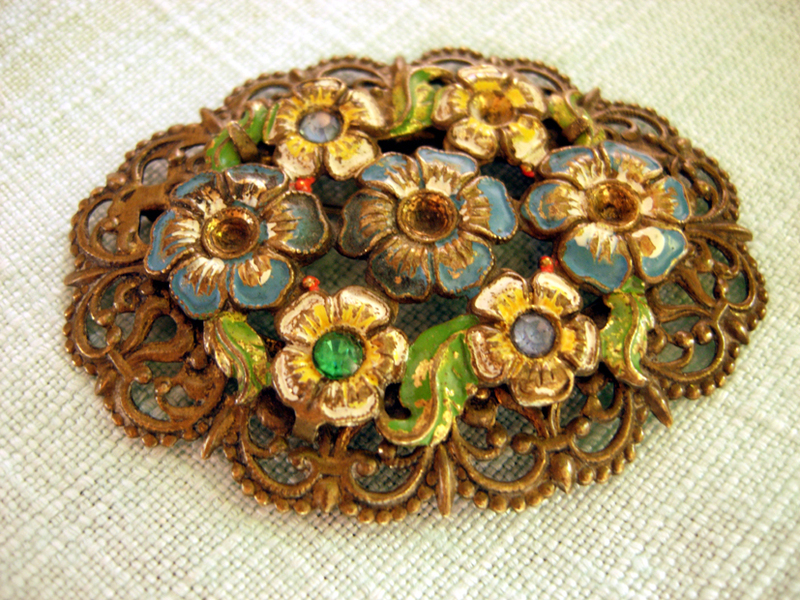 This brooch, from filigree brass, is marked Czechoslovakia on the clasp. 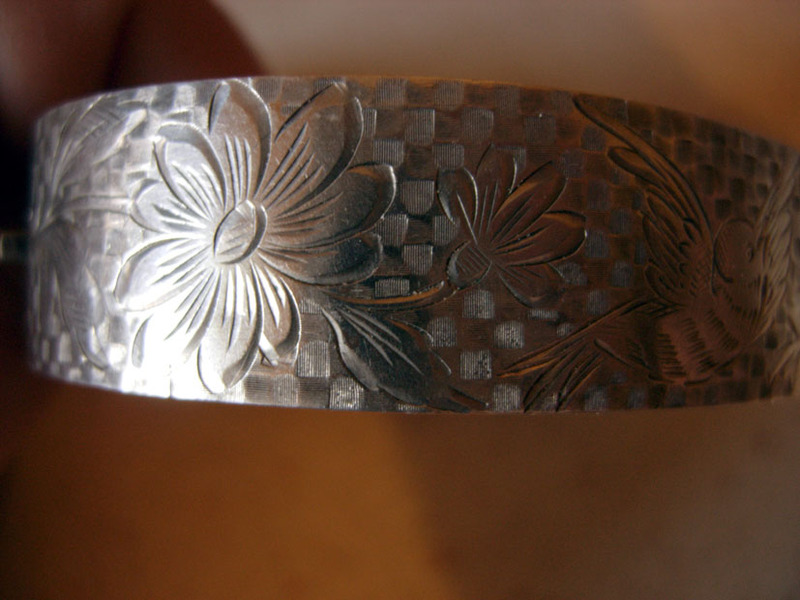 It’s really nice and old (from the thirties or forties), but most of the rhinestones are missing. 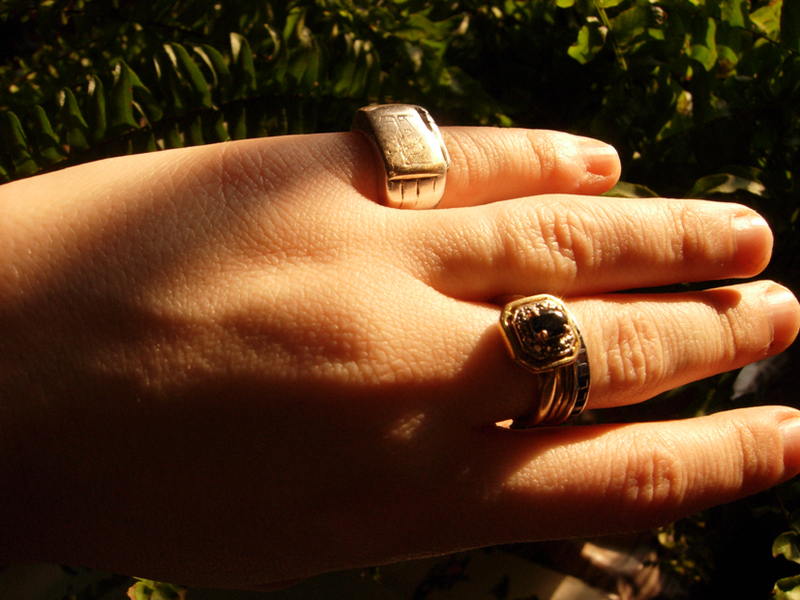 I’ll try to replace them with some matching old ones, when I find some. 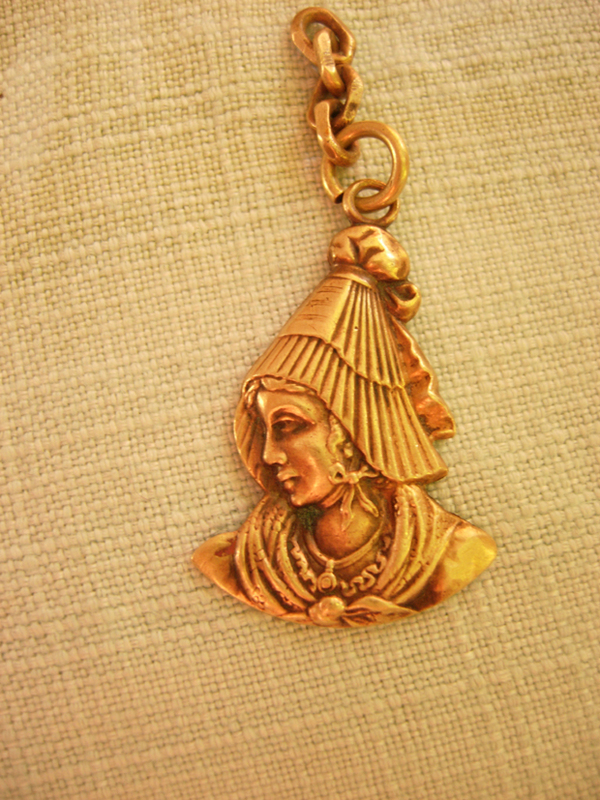 A copper thing that I don’t know what it was supposed to be (part of a necklace? 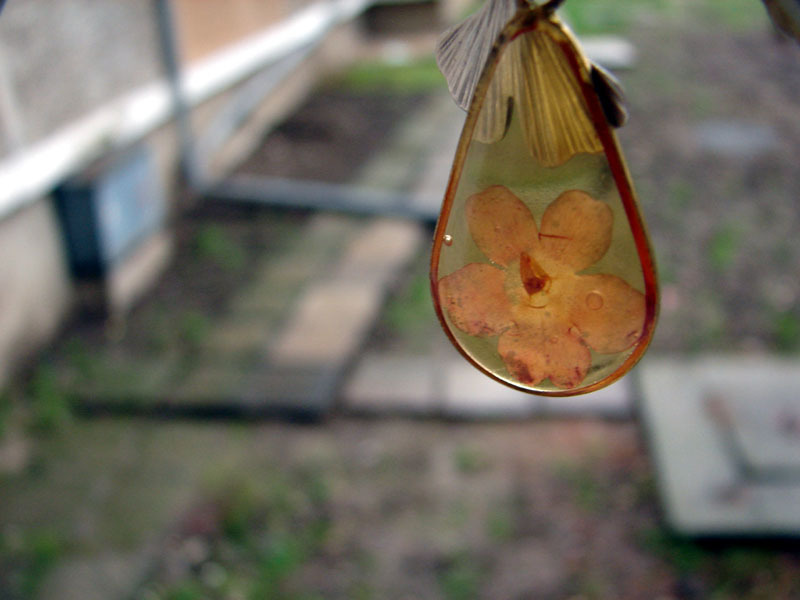 a key chain?, although it’s maybe too delicate for that). 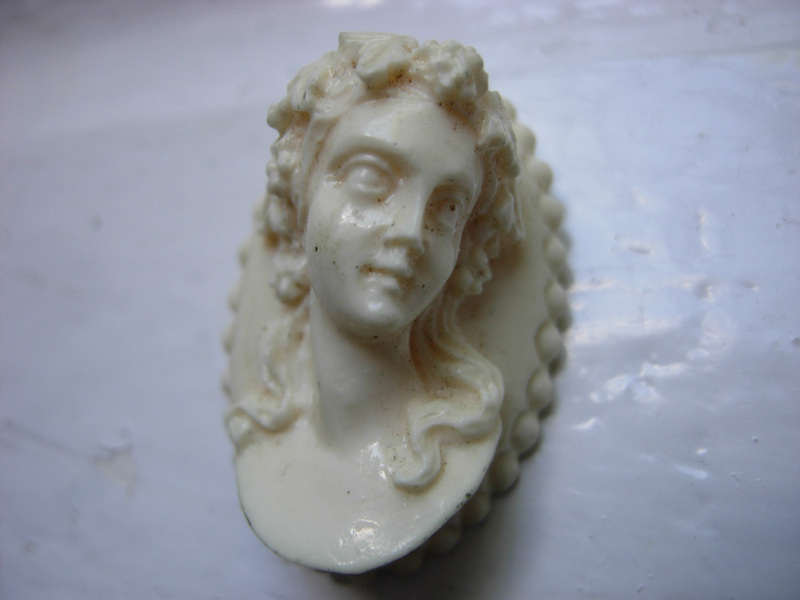 Anyway, I liked all the details on this fifteenth century lady. 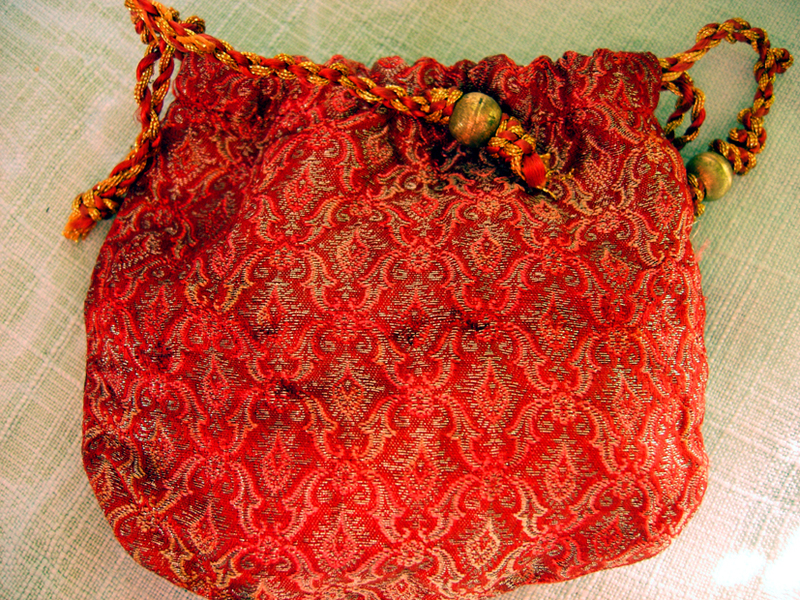 The vendor, which is my favorite at the flea market, gifted me this pretty silk coin purse to put all my finds in. 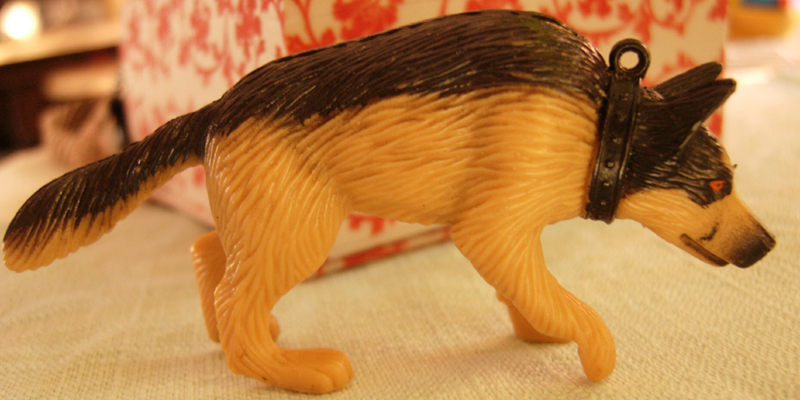 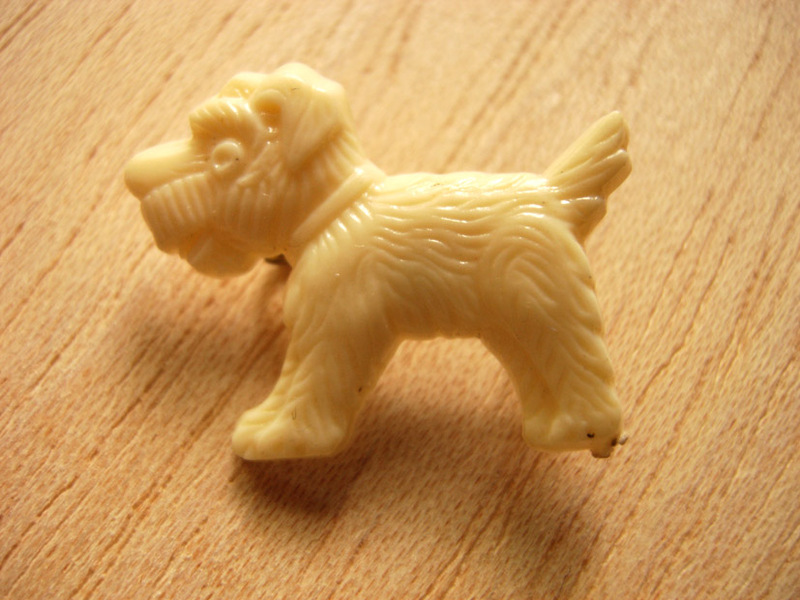 This dog is nothing special in itself, just a plastic toy, but it has the exact posture that my dog takes when frightened. 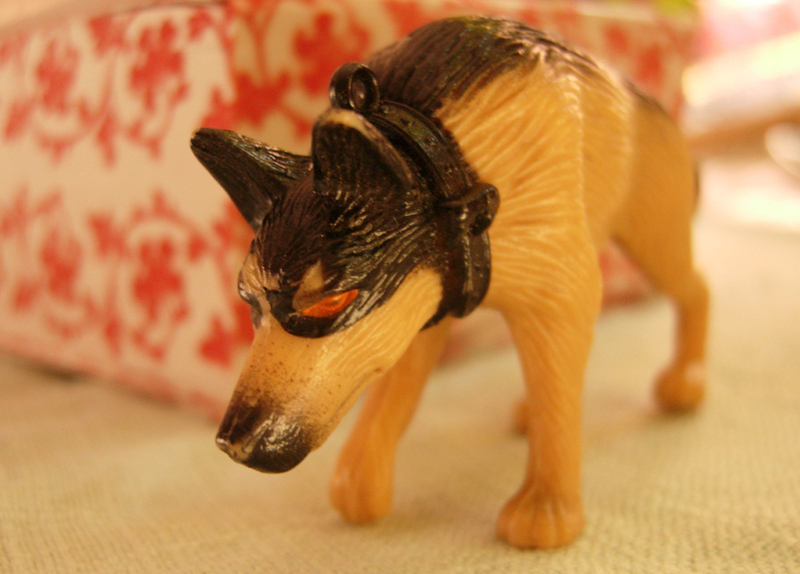 “Better to look really menacing than afraid…” :).